In which we care about Hugo Awards, Aussie SFF awards, harassment at conventions and tea-brewing spaceships all at the same time. You can get us at iTunes or Galactic Suburbia. WHAT DO WE CARE ABOUT THIS WEEK? Please send feedback to us at galacticsuburbia@gmail.com, follow us on Twitter at @galacticsuburbs, check out Galactic Suburbia Podcast on Facebook, support us at Patreon – which now includes access to the ever so exclusive GS Slack – and don’t forget to leave a review on iTunes if you love us! Post-cake and post-birthday we talk Kickstarter, Tiptree and Hawking: plus the Rights of Women. Get us at iTunes or Galactic Suburbia! Thanks for the cake love! Tiptree winner, shortlist & longlist announced. In which Galactic Suburbia is 8 years olds. We’re reading independently, making friends in Grade 3, and eating CAKE. You can hear us at iTunes or Galactic Suburbia. This episode is best consumed with cake, especially if you tweet, email or message us to say exactly what you’re eating. WHAT’S NEW ON THE INTERNET? Tansy’s Kickstarter launches on Wednesday March 14 – the Return of the Creature Court. Who Against Guns legal fundraiser, initiative of the Doctor Who podcasting alliance. Rachel Talalay’s piece on the epic #metoo women’s panel at Gallifrey 2018. Whovian Feminism’s breakdown summary of the same panel. Nominate for the Hugos NOOOOW! Alex: Basically, the Norma. Also Time Was, Ian McDonald; Firefly and Serenity rewatch. We’re back! Our now fully East Coast podcast has returned to delight and enrage you. You can us at iTunes or at Galactic Suburbia. WHAT’S NEW ON THE INTERNET/WHAT DO WE CARE ABOUT THIS WEEK? Tansy new novella Girl Reporter released, How To Survive An Epic Journey at Uncanny Magazine, progress report on Mother of Invention. Locus Recommended Reading List and poll now open for Locus Awards. Alex: Elysium Fire, Alastair Reynolds; Altered Carbon, Star Trek Disco; Norma reading; The Wicked and the Divine vol 5; Terry Pratchett: Tiffany Aching reread. What did you read to commemorate the passing of Ursula Le Guin? Check out the GS Bookclub re-read on our Facebook page. In which the trashfires are covered in rainbows this week. So many trashfires; so many rainbows. Huge congrats to all the QUILTBAG/LGBTQ Australians who got engaged since Wednesday 15th 2017, including friend of the podcast John Richards! You can get us at iTunes or at Galactic Suburbia. Australia voted Yes! And we really want Penny Wong to lead the country now please. Alisa: All the news. Literally all the news. Tansy’s new superhero novella Girl Reporter is available for pre-order now!! Check out her cover reveal on the Mary Sue. OUR DISCUSSION: Leisure, freelancing/part-time hours and guilt. In which Alex & Tansy talk awards, culture & promote each other’s projects. Get us from iTunes or at Galactic Suburbia. Locus Awards: so many winners. Mother of Invention: last day of Tansy’s Kickstarter campaign! Last chance to pledge! Luminescent Threads pre-orders open now. The Book Riot review/interview is here! How has Twelfth Planet Press has impacted on our listeners? Email galacticsuburbia@gmail.com to provide us with your anecdata! Galactic Suburbia 168: Live from Melbourne! In which we Continuum all the Continuum! Our live podcast, recorded on the afternoon of June 11 2016, with us still buzzing, inspired and surrounded by cake. Alex has a travel announcement. Alisa is knitting. You can get us at iTunes or Galactic Suburbia. Continuum 13! We were there! Rivqa Rafael’s Continuum tweets Storified. Mother of Invention: our campaign is past $11,000 and still going! Q&A: we answer your questions & take on your conversation topics. Thanks SO MUCH to our darling audience, who filled our seats, howled when we needed you to, came up with questions, and stayed blissfully quiet the rest of the time. If you hear a moment of odd, no-context-provided hilarity, just assume something funny has happened involving one of the Galactic Suburbia Gentleman’s Auxilary, or that someone is gesturing with cake. In which we launch new projects and Discover a new/old love for Star Trek. Bet you didn’t know how much we love Star Trek. You can find us on iTunes or at Galactic Suburbia. Nebula Weekend means awards and other announcements! 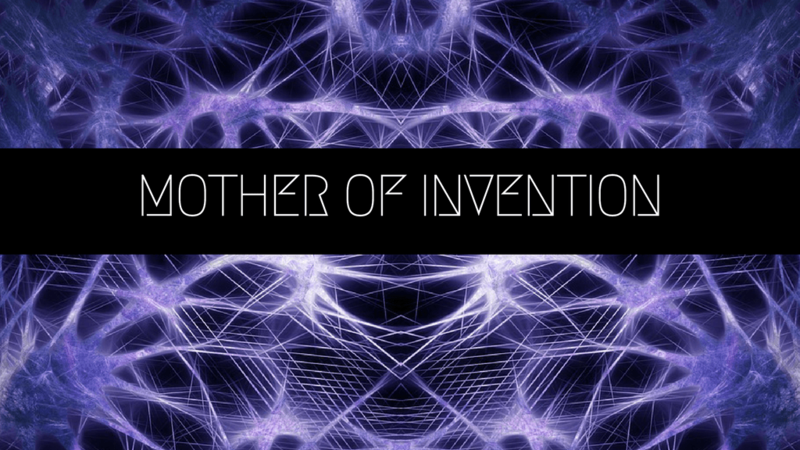 Tansy announces the impending Kickstarter for Mother of Invention: A speculative fiction anthology of diverse, challenging stories about gender & artificial intelligence. 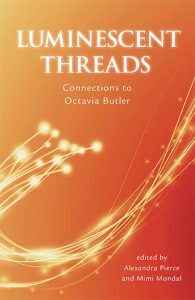 Alex reveals the cover of Luminescent Threads, the new book about Octavia Butler coming soon from Twelfth Planet Press. Alisa: Santa Clarita Diet S1; Anne with an E; Luminescent Threads edited by Alexandra Pierce and Mimi Mondal, Twin Peaks. All of us: Star Trek Discovery Trailer! We have a lot of feels. In which we debate the all important question, how much zombie vomit is too much zombie vomit? you can get us from iTunes or over at Galactic Suburbia. Sleeping With Monsters Book coming soon!